Exactly in two weeks time the Only Watch 2013 charity auction will be held in Monaco, and it’s confirmed that I will be present to report for in2watches.com. This year there will be 33 high-end, one-off, watches up for auction, which is 7 pieces less than the last auction in 2011. A lot of 14 bottles of vintage Lanson champagne is added to the list of watches though. However the auction list here above with the estimated values of the 33 watches learns that the total result of the auction in terms of value might be equal or even higher than in 2011. 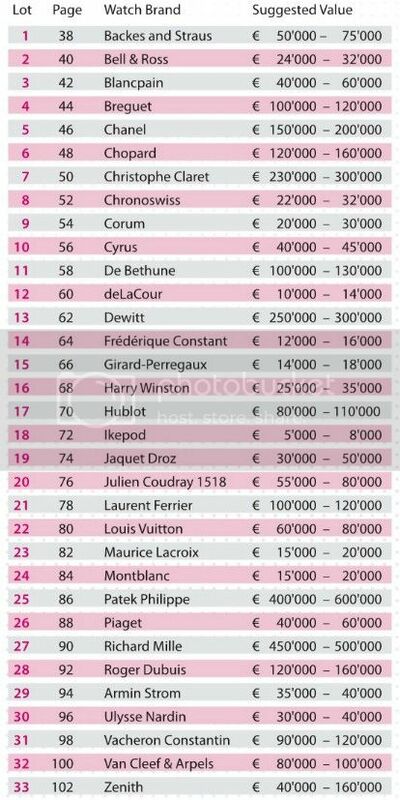 Addition of this years list indicates that a total amount of between € 2.852.000,= and € 3.835.000,= is estimated, which normally will be quit a bit exceeded at the auction it self. The expected less costly watch of the auction is the Ikepod Horizon, and like last auction in 2011, this years most expensive watch is thought to be the Patek Philippe. More from me at Only Watch 2013 I will be publishing when at the preview on the Monaco Yacht Show the days before the auction, and of course directly from and during the auction itself on September 28th, 11:00 hour (GMT+2). This entry was posted on September 14, 2013 at 08:00 and is filed under all, events, front page, news. You can follow any responses to this entry through the RSS 2.0 feed.